Cynicism Is SO Last Decade! All I ask of you is one thing, and I'm asking this particularly of young people who watch. Please do not be cynical. I hate cynicism - for the record, it's my least favorite quality and it doesn't lead anywhere. Nobody in life gets exactly what they thought they were going to get. But if you work really hard and you're kind, amazing things will happen. In playing with the thesaurus feature on my computer dictionary, I turned up these gems: Cynical = pessimistic, negative, world-weary, disillusioned, disenchanted, jaundiced, sardonic. That's a pretty good list. And who hasn't felt a bit pessimistic lately? Who isn't weary of the world? And when it comes to either politics or religion (let alone pop culture), who isn't disillusioned, disenchanted, or jaundiced? Here's the thing, though. Cynicism isn't big and tough and fearless. It's little and cowardly and fearful. By putting on the carapace of cynicism we think we're protecting ourselves from the world, when in fact what we're doing is shutting out life and people and all that actually matters in a misguided attempt at self-protection. Some time ago I wrote about a teaching from the Buddhist tradition known as Shambhala. I thought it was somewhat recently that I had done so, but it was actually about four years ago, so I figure I can plagiarize myself a little bit. In Chogyam Trungpa's book The Sacred Path of the Warrior, he describes the essential part of the sacred warrior as being his or her heart. And what do you think is the essential characteristic of that heart? How must an ordinary heart be changed, transformed, to make it a warrior's heart? You might expect that it needs to be strong, or solid, or steadfast, or perhaps full of courage (insert your best Cowardly Lion impression here). But no. What this Shambhala teaching says is that the essence of a warrior’s heart is that it is broken. Broken, soft and vulnerable. Only with a heart that is already broken, open wide, vulnerable, flexible, pliable, moveable, is a warrior able to go out and do battle in the world. Lest my Christian readers dismiss this teaching as being suitable only for practitioners of other faiths, I'll go way back into my memory vault of contemporary Christian music for this little gem of a song by the late Keith Green, My Eyes Are Dry. Oh, what can be done for an old heart like mine? Soften it up with oil and wine. The oil is you, your spirit of love. Please wash me anew in the wine of your blood. I know, there's the Christian obsession with the blood metaphor again. Let's work with the oil and wine for now. These both act as lubricants, albeit wine's lubricating qualities are more metaphoric. Oil loosens things, makes them unstuck. Wine, well, wine can sometimes loosen the tongue a bit too much, perhaps, but in the right quantity and setting it can warm and loosen the heart. Having just watched Julie and Julia, I was struck once again by Julia Child's joie de vivre, her passion, and her fearlessness. When it came to flipping an omelette on national television, she told her viewers that they just needed to have the courage of their conviction in order to succeed. Of course, she memorably failed in that first omelette flip, but she continued on undaunted, piecing together the remnants of her half-cooked eggs in the pan and turning out what to any observer looked to be a very credible French-style omelette. So there's a sampling of my spiritual teachers – Trungpa, Green, and Child. Funny enough, out of all of them Child probably lived the most exemplary life (personal struggles seem to be inherent in being a declared spiritual guru). But they all came back to the same idea. A courageous heart is an open heart, a vulnerable heart, one that embraces all it encounters, even those who would do it harm. To a cynical society it may seem a foolish way to live, but in truth it is the only way to actually be alive. Shifting back to culinary delights, dear readers, it's time for you to once again vicariously enjoy my gourmet adventures. We returned to Feast Restaurant in Atlanta for a dinner featuring (mostly) the wines of Joseph Swan, a small family-owned winery in the Russian River Valley of Sonoma County. I say “mostly” because a couple of the offerings were from other nearby wineries, such as the reception wine, a Sonoma Vineyards Chardonnay. Having had this before, I found it consistent with my prior impressions - an unoaked chardonnay, with a little pineapple tartness to it, light, easy to drink, but a fairly short finish. The first course was a salad of mesclun greens, diced golden beets, and goat cheese. Not just any goat cheese, mind you, but goat cheese in a fluffy ball, coated with (I'm guessing here) panko bread crumbs and ground nuts, and lightly fried. Thus began a theme for the evening, with its first incarnation being “How can you make cheese better? Fry it!” The wine was a Russian Hill Estates Chardonnay from the Gail Ann's Vineyard (named in honor of Warren Dutton's wife), 2005 if I'm not mistaken. At 14.7% ABV, I was surprised to not be overwhelmed by sweetness or oakiness. In fact, this wine had a beautifully restrained fruit flavor, with citrus and pears predominant. The second course was an apple and cherry stuffed quail wrapped in pancetta with a brown butter sage sauce. Continuing the theme - “How do you make quail better? Wrap it in bacon!” One dining companion's comment was “OMG this is so good!” (OK, she didn't actually say “OMG” abbreviated, but you get the idea.) I agreed with that sentiment. The quail was perfectly prepared, the sauce was very rich, and the wine paired very well. Said wine was the first of our three Joseph Swan offerings, their 2007 Cuvée de Trois Pinot Noir (which, for those of you who care about ratings, earned a 93 point rating from Wine Spectator as well as their “Best Value Pinot Noir for 2009”). I should note that the name is currently outdated, as the winemaker Rod Berglund explained to us that he now uses four vineyard to source this wine rather than three, but they just didn't want the hassle of changing the name! This Pinot was a flavor assault up front (but in a good way! ), with tastes of raspberries and cherries and hints of chocolate, minerality, and spice. This course was a perfect display of wine as food and of wine pairing with food. Course #3 was pan seared ostrich with roasted root vegetables, caramelized onions, and a zinfandel sauce. The flavors were outstandingly rich and dense, as you can imagine. The only drawback was that the ostrich seemed a bit overcooked (as can happen easily with ostrich, and I suppose especially when one kitchen is trying to turn out 30+ covers simultaneously), and thus the texture was too chewy and tough. Despite this execution stumble, the pairing was solid – the wine was Joseph Swan's 2005 Zinfandel from the Mancini Ranch Vineyard. This Zinfandel had classic Zin characteristics of dark cherry and black pepper, but it was restrained and balanced, something that so few California Zinfandels achieve. 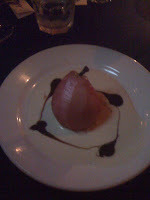 Dessert was a whole poached pear with a Pinot Noir crème anglaise. It was served at room temperature, although I might have preferred it warmer. Nevertheless, the fruit was great and the sauce was amazing – my picture probably doesn't do it justice, but the dark puddles in the creamy sauce were the Pinot Noir reduction, which had the consistency of caramel. Theme again - “How do you make Pinot Noir better? Make Pinot Noir candy out of it!” OK, so that's stretching the theme, mostly because it would be hard to improve upon the 2006 Pinot Noir from Saralee's Vineyard (again for you rating-heads, a 91 point WS offering). This Pinot was a very pretty and elegant wine, with a pale rose color yet bursting with flavors of red berries and a nice perfume. I noted some cherry and chocolate as well, and was surprised at how full the flavors were for such a lightly colored wine. In closing, the late Joe Swan (yes, there was a real Joseph Swan) is quoted on the Winery's website as saying “There are few more civilized pleasures in life than good company, good food, and good wine.” These are words we can all live by. Blogger's Note: In the interest of full disclosure, I have received a small amount of compensation from this restaurant for consulting work, but not for this or any other review. In a 5-4 decision this week, the Supreme Court ruled that the government cannot prevent corporations from spending money on behalf of political candidates. This decision overturned two longstanding precedents, and will have an enormous impact on future elections. As President Obama described it, the decision was “a major victory for big oil, Wall Street banks, health insurance companies and the other powerful interests that marshal their power every day in Washington to drown out the voices of everyday Americans.” Supporters of the decision defended it on free speech grounds, asserting that the Justices rightly applied the protections of the First Amendment to corporations. I find this decision frightening. Imagine, if you will, a candidate for high office (new or incumbent) who dares to suggest that a large corporation (or group of corporations) should pay a slightly higher tax. For example, a carbon tax on fossil fuel products in order to pay for remediation of global climate change, maybe a modest surtax like an additional 1% of profits. For a corporation like ExxonMobil, that would translate into a $450 million tax (based on 2008 figures). In order to save $450 million, wouldn't you imagine that ExxonMobil would be willing to spend tens of millions of dollars to defeat said candidate, perhaps even $100 million? Now combine ExxonMobil with the rest of Big Oil, and you can rapidly collect many hundreds of millions of dollars to defeat an environmentally-minded Presidential candidate. For comparison, candidate Obama spent about $740 million in the 2008 election cycle, while candidate McCain spent about $330 million. Thus, it's easy to see how one industry sector could equal the entire spending of a single candidate! Now combine Big Oil with Wall Street firms and health insurance and pharmaceutical companies, and the dollars could quickly climb into the billions. There are two equations at work here that enter into the Supreme Court's calculus on behalf of corporate political spending: money = speech, and corporations = persons. I consider both of these equations to be erroneous and in serious need of rethinking. For now, however, I want to focus on the latter equation, the legal fiction of corporate personhood – that is, the notion that corporations are to be treated like “persons” under the law. This concept originally arose not as a benefit to corporations, but rather as a benefit to their creditors (or those who would seek to recover damages inflicted by the actions of a corporation). Before this concept existed, corporations could argue that since they were not “persons” under the law, they could not be subject to lawsuits, and furthermore, other legal protections guaranteed the limited liability of shareholders of corporations, meaning that they also could not be sued for actions of the corporation. In such a scenario, creditors could not seek legal relief for claims against corporations. Enter the corporate personhood fiction. If the courts treated corporations as persons under the law this dilemma is resolved, and individual people (“natural persons”) feel safe doing business with corporations, banks feel safe extending credit to corporations, and corporate businesses thrive. Over time, however, this legal fiction of corporate personhood has expanded far beyond its original intent, such as in this week's Supreme Court case. What's more, the Court has completely flipped the original intent of holding corporations liable for their actions, and now appears more interested in protecting corporations rather than those who do business with them (i.e., “natural persons”). The evolution of this concept has been ongoing, and this isn't the first Court decision to move the concept further down what I consider to be a troubling path. It is, however, a major leap forward along that path, a truly “activist” decision by a group of Justices supposedly dedicated to a “non-activist” judicial philosophy. Where does that path lead, and what will America look like at the end of the road? Let's just say that if you think politicians are bought and paid for by corporate interests now, you ain't seen nothing yet. The extent to which he [Woods] can recover seems to me depends on his faith. He is said to be a Buddhist. I don't think that faith offers the kind of forgiveness and redemption that is offered by the Christian faith. So, my message to Tiger would, Tiger, turn to the Christian faith and you can make a total recovery and be a great example to the world. The criticisms have been vociferous. Most have taken the form of “What gives him the right to say this?” “How can he claim to be a Christian?” and the like. When I first considered writing about this incident I had some of those initial reactions, but having thought about this further I've arrived at some self-surprising conclusions. Bear with me. Let's take some of these criticisms head-on. First, “What gives him the right to say this?” Actually, this one's easy to answer. Recognize this language? God loves you and offers a wonderful plan for your life. Man is sinful and separated from God. Therefore, he cannot know and experience God's love and plan for his life. Jesus Christ is God's only provision for man's sin. Through Him you can know and experience God's love and plan for your life. We must individually receive Jesus Christ as Savior and Lord; then we can know and experience God's love and plan for our lives. If you recognize this language, then you and I ran in some of the same crowds in college. Regardless, if you actually believe this theology, then it's incumbent upon you to share this knowledge with as many people as you possibly can. Doing otherwise would be a grave disrespect of your fellow human being's eternal soul, and would be downright unloving. I have absolutely no question about Hume's sincerity. I think he really does believe what he said, that Buddhism offers no chance for eternal forgiveness, and that for Woods to save his soul he needs to put his faith in Jesus Christ. Further, I believe that in America, Hume has every right to say that as often as he wants and in as many ways as he can. Now, just because someone's sincere doesn't mean they're right. One can be sincere and also be sincerely mistaken, or sincerely deluded. Buddhism doesn't offer the kind of eternal slate-cleaning that Hume's Christianity does, but that's because Buddhism doesn't believe in a supreme deity who keeps an account of sins and punishes sinners (meaning, of course, all of us) with eternal damnation unless we accept the human blood sacrifice of an incarnated man-god who took on the wrath of said supreme deity (who happened to be his own father) in our stead. (Kind of makes the Campus Crusade language above sound better, doesn't it?) What Buddhism does believe is karma, the principle that causes have effects and that our actions have consequences. This belief makes individuals responsible for their own actions (and according to many interpretations, they are responsible for their actions in past lives as well). It precludes the necessity for divine forgiveness, but does not release a person from the need to find forgiveness in his or her own life and relationships. In short, I find Hume's error not to be his sincerity of faith, but rather his ignorance of other faiths. He, like so many followers of faith traditions (not just Christians – if you want some really messed-up but dedicated people, let's start with Al Qaeda), is convinced that his way is the one true and right way, to the exclusion of all other possible ways. Many (but not all) people who hold this kind of faith have had little exposure to people of other faiths who display many of the same virtues extolled by one's own faith. This kind of exclusive faith-claim thinking leads to all kinds of bad outcomes (see, e.g., the Crusades, the Inquisition, 9/11, etc. ), and it's this kind of thinking that enlightened people need to struggle against if we are to truly save the world. Something happened a long time ago in Haiti, and people might not want to talk about it. They were under the heel of the French. You know, Napoleon III, or whatever. And they got together and swore a pact to the devil. They said, we will serve you if you'll get us free from the French. True story. And so, the devil said, okay it's a deal. Wow. Brother Pat, you're an asshat.